If a mechanical or electrical contractor is needed, BMI Energy will contact the client’s “manager in charge” or a contractor / vendor, selected by the client, to handle work for the building. BMI works as an independent advocate for the client to keep maintenance costs down. When the contractor is sent to the building, BMI can direct them to the area of need, assist in diagnosing the issue and verify that the problem is corrected, before they leave the building. This save time and money for the repair and reduces call backs. BMI can identify when a vendor arrived at the building and what time they left, verifying the time and charges for the visit. All mechanical issues are kept in a data base, so there is a history of all monitored and controlled equipment in each building. 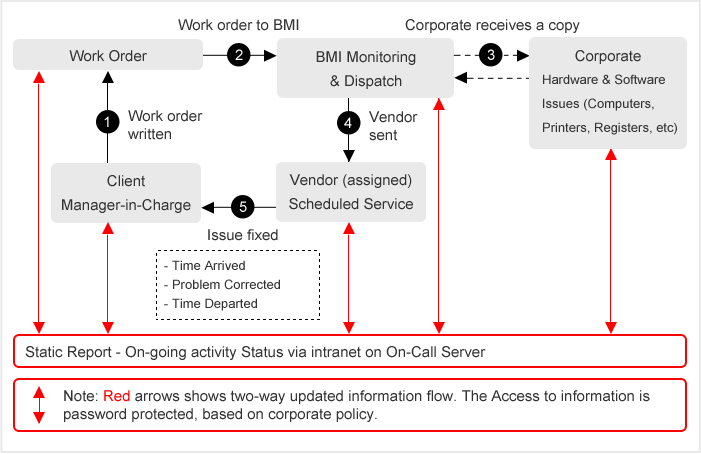 The On-Call Maintenance flow chart (See below) shows how a work order would come in from a location and process through the BMI Energy Monitoring Department. If necessary, BMI would dispatch the appropriate contractor to investigate the problem. When the work is completed, the contractor sends the information to our monitoring department. All managers and key personnel would be able to see what’s going on and the status of the repair. All of this data is saved and provided to the client, as needed.